← I’m Not Sure I’ve Saved Enough for College. Now What? 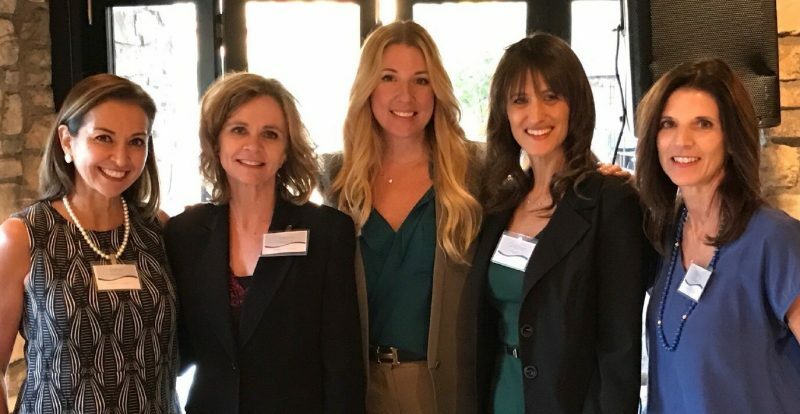 On Thursday, October 13th, Manchester Financial hosted their third Women in Financial Transition panel and reception at the Westlake Village Inn. Marketing Director, Nancy Angle, organized and emceed this growing and consistently-popular event. Over 40 women gathered to enjoy delicious food and wine in the beautiful setting of the Wine Cellar at the local hotel. “It’s rewarding to share our resources and the expertise of the speakers through this series. Our third event was an evening of engaging presentations, camaraderie, and encouragement to take action in one’s financial life,” says Angle. Manchester Financial Senior Analyst, Jennifer Leighton, created the lecture series to fill a void in the financial education of women as they navigate life’s transitions. From the divorcing to the widowed, from the new mom re-entering the workforce to the retiree, Manchester Financial strives to give women the tools they need to create financial health. Emphasizing a holistic approach to finances, Leighton created a diverse speaker panel including Gretchen Hydo, life coach; Laura Navarro, CFP and Manchester Financial Advisor; and Esther Hopkins, estate attorney. Leighton also spoke about the importance of proactive financial planning in order to create a secure future. “It’s an unfortunate reality that women lag behind men when it comes to financial confidence. In order to shrink this ‘confidence gap,’ Manchester Financial is firmly committed to providing opportunities for women to educate and empower themselves. We see the Women in Financial Transition series as an integral part of achieving this goal and are so excited about its success and popularity with the women of our community,” says Leighton. Susannah Beard is an Alternative Investment Specialist with Manchester Financial, an Investment Counsel/Wealth Management firm located in Westlake Village. For more information call 800-492-1107. This entry was posted in Women in Transition and tagged Financial Education, Women in Financial Transition. Bookmark the permalink.